I do. When I have time. I love stitching ornaments for my handmade tree (the decorations, not the tree). Over the years I have been slowly adding more and more. Most of the ornaments are from gifts and exchanges, with several very special ones. I will talk about these more in December. 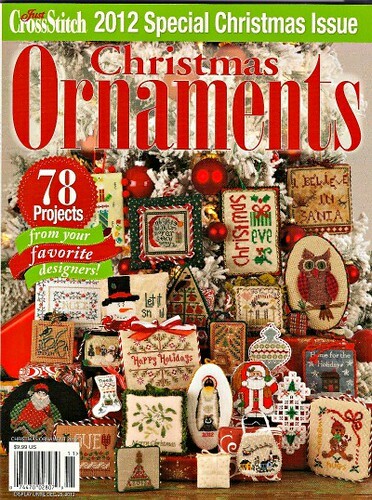 My favourite source for my ornaments is always the Just Cross Stitch Ornaments issue. I have more than a dozen in my collection. I am tempted to say around 14 or so, but I would have sit down and count each one. Last year, I stocked this magazine for the first time since we returned from Europe, and I have been anxiously waiting for the 2012 issue to arrive. It did – yesterday. The Needlework Boutique has 9 copies in stock! And you are the first to hear about it, because the magazine is not yet on the website! So what is so special about this magazine? Well, for $15, it is full of ornaments. 78 in total. From 78 designers. As diverse as Charlotte’s Web Needlework, Country Cottage Needleworks, Full Circle Designs, Dragon Dreams and The Workbasket. As I flipped through the magazine last night, I started making a mental list of all the designs that I would love to do. Starting with Blue Ribbon Designs Roaming Reindeer. And Mosey ‘N Me’s Santa’s Helper.